Joe Weider performing a 95 pound one arm military press at Sig Klein's gym. I believe that it was some time in the year 1932 that a powerful young man visited me, and after speaking with him a few moments I could not help but notice his thick wrists, though he had a rather small, well-shaped hand. I asked him to roll up his sleeve, and I must say that he has quite a job of rolling his sleeve up to the elbow. Here was about the best looking, largest forearm that I had ever seen. It was more impressive than Massimo’s or Dandurand’s – and that is saying something for forearms. Naturally I became more and more interested in this visitor, and asked him if he would be kind enough to strip down for me, as I would like to see the development that he possessed. I showed him into the dressing room. It was about six o’clock in the evening and the regular pupils were now coming in for their workout. The dressing room was getting a bit crowded. When this visitor started to undress, it looked as though the more clothing he took off the larger he looked. The other men as well as myself could not help but stare at the visitor. I loaned him a pair of trunks and asked him to go on the gym floor and perform some stunts for us. He was bashful, very bashful, and immediately told me that there was not much that he could do, anda furthermore I must have plenty of boys around that could do so much more and had much better physiques. He finally did a few lifts for us. But what really surprised and pleased us all so much was when he took a 185 pound barbell, placed it on his shoulders, and did about a dozen deep knee bend jumps, with this weight on his shoulders. He leaped up about ten inches, straightened his legs as he jumped up, then came down into a deep knee bend, and from there jumped up again. This was something to see. His leg muscles stood out in bands as he did this. This was my first meeting with John Grimek. I asked him his name again and why it was that we in the weightlifting game had not seen or heard more about him. It was, I assure you, genuine modesty that prevented him from making appearances at the various shows. I intended to do something about this, and after he left that evening I at once wrote Mark Berry about this remarkable athlete and muscular marvel, and informed Berry that he must write and get in touch with John Grimek. I could write and tell you much more about Grimek, but if I did so, I would be telling you the story that John himself will tell you so much better than I could ever do. It was also about this time that I heard that Adolph Nordquest was in New York, and he visited the gymnasium too. We had some very interesting talks about the oldtimers, and I introduced Mr. Nordquest to Carl Easton Williams, then editor of “Physical Culture” magazine, who was training at my gym. 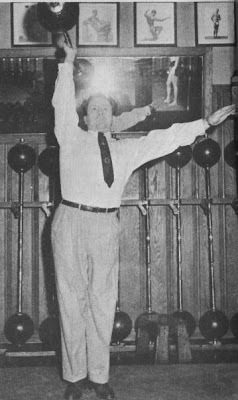 Mr. Williams thought it would be a fine idea if Adolph Nordquest would write about his experiences as an athlete for the magazine. The English “Superman” magazine, always trying to arouse interest in physical development, would from time to time conduct posing contests. In the Spring of 1933, it occurred to the editors that they would like to find out who was the most popular physical culturist. In the May 1933 issue the results were published, and as could be expected, two English athletes, Alan P. Mead and Lawrence A. Woodford, won first and second place. They only published the first five winners, and the next three were myself, winning with 1830 votes, Lionel Strongfort with 1450 votes and Tony Sansone with 1440 votes. 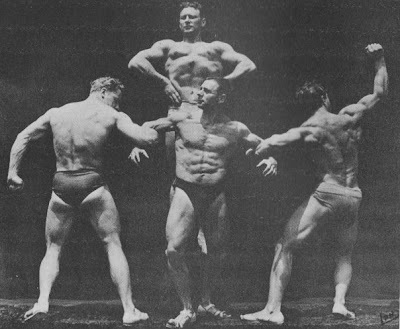 I do not wish to belittle the first and second winners, for they both have remarkable physiques, and their poses were really exceptionally beautiful. Mr. MacFadden also asked me to pose for the illustrations on weight lifting exercises to be featured in his new and revised edition of the “Encyclopedia of Physical Culture.” I appeared at various shows from time to time, and it seemed that at most of the shows I was introduced as the lightweight and middleweight weightlifting champion of America, and open to challenge. In the March 1933 issue of “Strength” magazine, I noticed that Mr. Mark Berry claimed that Mr. Linwood Lilly was unquestionably the strongest middleweight weightlifter in the country, barring the three Olympic lifts, and so on March 4, 1933, at a weightlifting show held in New York City, Mr. Linwood openly challenged me to a contest for the title of middleweight weightlifting champion. Of course I accepted this challenge, being very eager to meet all comers in contest, and considered Mr. Lilly a worthy opponent. Since I was the accepted champion and Mr. Lilly the challenger (Mr. Berry admitted that Lilly could not beat me on the Olympic lifts), I felt that I should be the one to select the lifts, particularly since Lilly wanted to prove that he was stronger than I was. I believe that it would be proper to reproduce here the letters that were published at the time in “Strength’ magazine. My first letter regarding the challenge follows. 1.) Two Arm Curl – Body in Military position throughout the lift. 2.) Crucifix – two dumbells lowered from above, body in Military position. 3.) Two Arm Pullover – weight to be raised from the thighs only to upright position. 4.) Two Hands Clean – using 100 pound dumbell, in each hand. pressing as many times as possible, weight not to be less than 100 pounds (See-Saw style). 5.) One Arm Clean and Side Press, stiff-legged press. 6.) One Arm Get-Up, with kettlebell, right handed, left hand not to touch the weight throughout the lift. 7.) Two Arm Military Press, from behind neck. 8.) Two Hands Dead Lift. 9.) Deep Knee Bend, weight to be put on back unassisted. 10.) Two Arm Press lying on back – Body to be flat on back throughout the press, weight can be brought to starting position from thighs with slight bridge. These lifts are a test of general strength, which means, as you know, strength throughout the body, and are lifts which have been used by recognized “Strong-men” of the past whose feats have earned them ratings as champions. They are the standards by which others have been estimated. I would like to be arbitrator for the contest between Mr. Lilly and myself and set the date for the contest and select the judges, you being the referee, since I believe that you are recognized as being fully qualified to act in such a capacity and attend to all other details that such a contest calls for. I am sure that you shall be accepted by Mr. Lilly for this task. I shall be grateful to you for your cooperation. You would be doing me a great favor, Mr. Berry, if you would publish this letter in your magazine, as I am sure that your readers would like to know about such a contest.